Looking like grass but really a member of the lily family, mondo grass forms clumps of curving, linear leaves, which work well as a ground covers in garden settings. Most often mondo grass is the species Ophiopogon japonicus, but another species, Ophiopogon planiscapus is also called mondo grass and has a variety with dark purple foliage known as black mondo grass. Grow these species of mondo grass in a fertile, moist, well-draining soil in partial sunlight exposures in U.S. Department of Agriculture hardiness zones 7 through 10. Clip back the blades of mondo grass with a heavy-duty scissors or lawn clippers in early to mid-spring before new leaf growth has started. Make the cuts so that 1 to 2 inches of leaves remain on the plant. Do not allow the pruning debris to remain atop the mondo grass plants. This is the same technique used on lilyturf plants (Liriope spp.). Water and fertilize the pruned mondo grass to encourage healthy, robust rejuvenation of leaves in mid to late spring. Spot-cut or pull out any leaves or tufts of foliage that brown and dry during the growing season and into the cooler winter months. Do not over-water the mondo grass during winter so less foliage dies back from rot. Lush, healthy mondo grass doesn't need annual pruning to keep it looking its best. Only when drought, a severe winter or other seasonal woes causes foliage to look tattered would you need to consider pruning it. Pruning may be necessary only every other spring or every third spring. If you have an expansive area of mondo grass, consider using a lawn mower with its blade set at 2 inches to quickly and evenly prune the patch. Dwarf selections of mondo grass that only grow 2 inches tall are best pruned by hand or a weed trimmer. 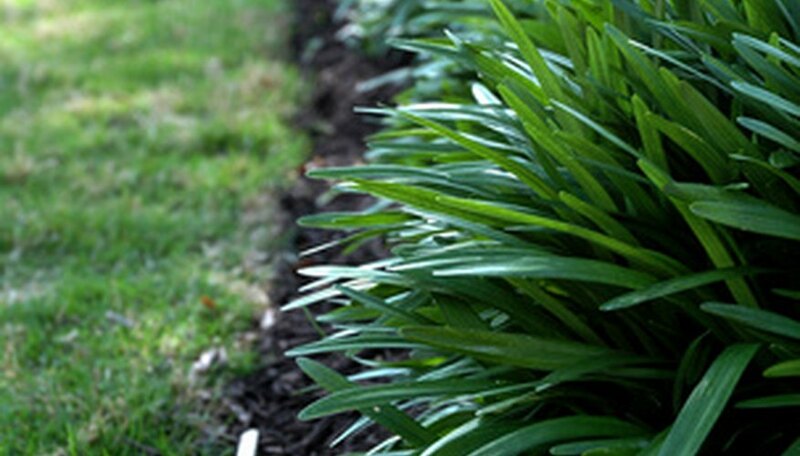 Do not prune mondo grass back in fall and winter. It may put undue stress on the plants leading into the colder winter months and may expose plants to increased frost and freeze injury.